THIS is the variety of rice without which biryani, the royal gastronomical delight, would not feature so prominantly in the history pages on Mughal influence in India. Aromatic, long-grained, nonsticky are the words that describe it. It is the Basmati. India grows 1.6 million tonnes annually. Two-thirds is exported every year. India claims its traditional knowledge of the climate, the soil and the crop has helped develop such superior variety. So does Pakistan. 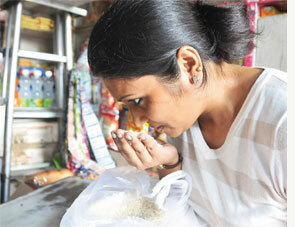 The two countries are fighting for a geographical indication (GI) status for Basmati rice. India has reduced the minimum export price because Pakistan is exporting at even lower prices. But for an average Indian household it is still expensive. Bought at a price of Rs 75 per kg it is reserved for special occasions. While a GI registration for Basmati rice is pending, the Indian pride received a jolt because the gene responsible for the fragrance did not originate from the Indian variety of rice. There are 100 volatile compounds responsible for fragrance in rice. The most important is one known as 2- acetyl-1-pyrroline, found in the Basmati and Jasmine (Thai) variety. Studies have shown that a BADH2 gene codes for this aromatic compound. Scientists from the Cornell University, New York and International Rice Research Institute, Philippines decided to trace the origin of this fragrance. There are two main varieties: Japonica (first domesticated in Southern China) and Indica (domesticated in South Asia). Both belong to the Oryza sativa group. While Japonica is the sticky short-grained variety, Indica is the non sticky long-grained variety. The team sequenced the gene from 242 different rice varieties. The gene's dominant variant (badh2.1) that codes for the fragrance is found in both Japonica and Indica varieties. The study published in the August edition of the Proceeding of the National Academy of Science concluded that the variant originated from the Japonica variety. The study also explains that the gene entered the Indica variety through chance crossbreeding between the different varieties. Although the study has traced the origin of the gene, it does not say anything on the origin of Basmati rice. "The study just gives a clue to begin with but it does not conclude that the Japonica variety is the parent Basmati variety," said K V Prabhu, head of the genetics department at the Indian Agricultural Research Institute, Delhi. 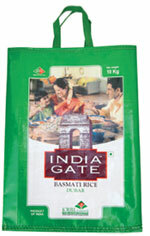 Besides, the Indian variety of Basmati rice is not the pure Indica variety. U S Singh, the South Asia regional project coordinator of International Rice Research Institute explained that Basmati lies somewhere between the Indica and the Japonica variety. "Even if the the gene has been traced to Japonica it is unlikely to have any ownership implications as this variety does not belong to any one country specifically," assured Singh. This is good news for India as it fights for the GI status. "GI is crystallization of traditional knowledge and practices that are evocative of a geographical region. Even if the rice line did come from some other country 1,000 years ago, Basmati is recognized worldwide as the fragrant rice grown in the foothills of the Himalaya," explained Sunita K Sreedharan, a patent lawyer from Delhi.